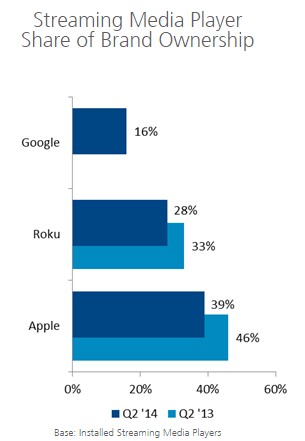 The low-cost set-top boxes used with over-the-top video entertainment services, such as Netflix and Hulu, were instrumental in early market development -- prior to the availability of internet-enabled Smart TV sets. Market demand is still strong. Streaming media players were added to 6 million American homes over the past year, increasing ownership penetration to 17 percent of U.S. Internet households in the second quarter (Q2) of 2014, according to the latest market study by The NPD Group. Moreover, streaming media player ownership is expected to increase to 39 percent of U.S. Internet households by the beginning of 2017. The current, and future, penetration increases are being driven by three main factors; more brands in the market, more software apps, and lower device prices. "In its infancy, the streaming media player market had two major players driving growth; Apple and Roku – now we have four relevant hardware manufacturers with the addition of Amazon Fire TV and Google Chromecast," said John Buffone, executive director at NPD. NPD believes that content is what's going to bring these devices to the next level. It's not just necessary to be able to stream popular video services such as Netflix and Hulu. Device manufacturers must also have the ability to attract a wide array of content owners and developers to build apps for their platforms – which is the direction Apple, Roku, Google, and Amazon are taking with their devices. Even with all of the upgrades to these devices, prices are coming down, making them more attractive. The average price of a streaming media player dropped from $88 in 2012 to $61 in the first half of 2014, according to the NPD market assessment. "The decline in price was initiated by Google with its $35 Chromecast, and it wasn't long before others, like Roku, responded competitively with solutions such as its HDMI streaming stick for $49," said Buffone. Affordability can drive impulse buying, rapid increases in ownership, and in turn it is increasing the number of homes with access to media apps on TV. It's quickly becoming a great new channel content owners can use to grow the audience for popular TV shows, movies and more.